A La Carte Cuisine Thai Peanut Chicken Satays $50 / 50 pcs Skewered Breasts of Chicken Oven-Roasted in a Thai Peanut Sauce Mini Crab Cakes $70 / 50 pcs Miniature Lump Crab Cakes Served with a Sweet Chili Sauce for Dipping Warm Mini Muffalettas $80 / 50 pcs Traditional Muffalettas with Olive Salad. Served Warm Jumbo Shrimp Cocktail $75 / 50 pcs Jumbo Shrimp, Boiled and Served Cold with Cocktail Sauce for Dipping Bacon-Wrapped Scallops $95 / 50 pcs Roasted and Served Hot from our Oven Teriyaki Filet Satays $80 / 50 pcs Skewered Filet Mignon Marinated in Sweet Teriyaki and Oven Roasted Mushroom Canapés $75 / 50 pcs Chopped Assorted Mushrooms Topped with Manchego Cheese on Baguette Shrimp Pastry Canapés $75 / 50 pcs Shrimp, Blue Cheese and Chopped Nuts Wrapped in Puff Pastry with Sweet Thai Chili Sauce Roasted Prosciutto-Wrapped Fig Canapés $75 / 50 pcs Stuffed with Blue Cheese and Walnuts and Drizzled with a Balsamic Reduction Baked Brie Platter $50 Drizzled with a Balsamic Reduction and Vanilla Honey, Topped with Sliced Almonds Assorted Mini Quiche $65 / 50 pcs Assorted Individual-Sized Quiche Cubed Cheese Platter $50 Assortment of Cubed Cheeses Served with Crackers Fresh Fruit Platter $50 Assortment of Fresh Cut Fruit Wine Loft Pimento Cheese $50 Our twist on a traditional with smoked Gouda, cheddar and cream cheese, roasted red peppers and just a hint of jalapeño heat. Served with Pita chips. Hummus With Pita Chips $50 Vegetable Platter $50 Assortment of Veggies Served with Buttermilk Ranch Dressing Assorted Sweets Platter $65 Assortment of Dessert Items for the Sweet Tooth Buffet Style Cuisine Smoked Salmon Display $175 Chilled Smoked Salmon Filet Served with Capers, Crème Fraiche, Pepperoncinis and Pita Chips Artisan Cheese Board $150 Large Cheese Display Featuring Hand-Crafted Cheeses, Salted Nuts, and Baguette Bread Filet Mignon Salad $140 Herb-Crusted Filet Mignon, Blue Cheese, Dried Cranberries, Grape Tomatoes and English Walnuts with Pepper Jelly Vinaigrette Shrimp & Grits $175 Shrimp Scampi served with Goat Cheese Grits and Pork Sausage in a Large Chafing Dish Charcuterie Board $160 Chef’s Selection of Gourmet Meats, Warm Bread and Traditional Accompaniments Prix Fixe Options Chicken Cordon Bleu Breaded Chicken Breast Stuffed with Ham and a Blend American & Swiss Cheese. Served with Rosemary Roasted Potatoes and Garlic Green Beans. Beef Brisket Oven-roasted Brisket with Gravy. Served with Mashed Potatoes and English Peas. Ravioli Florentine Ravioli Stuffed with Spinach and Five-Cheese Blend, Topped with Basil Tomato Sauce and topped with Mozzarella Cheese. Served with Garlic Green Beans and Toasted Garlic Bread. Salmon Filet Oven Roasted Filet of Salmon Served With Seasoned Rice and Roasted Seasonal Vegetables. All Prix Fixe Options are $20 per person excluding tax and tip. Add Mixed Green Salad : $21 per person. Add Salad and Dessert: $23 per person. Side items can be changed upon request. Minimum of 50 Orders Required. Host Bar Options House Package $8 per person per hour Selection of House Wines and Domestic Beer. Select Beer House Package $9 per person per hour Selection of House Wines and Domestic, Imported and Draft Beer. Standard Package $10 per person per hour House Wines, Domestic, Imported and Draft Beer, and mixed drinks containing Stolichnaya, Bacardi, Beefeaters, Canadian Club, Dewar’s, Jack Daniels, and Jose Cuervo. Premium Package $12 per person per hour Standard Package Selections with the addition of Grey Goose, Ketel One, Ciroc, Crown Royal, Glenlivet, Johnny Walker Red, Tanqueray, Bombay Sapphire, and Bacardi Select. The Wine Loft does not charge a fee to reserve space. The only cost to you is the food and drink you choose to provide for your guests, plus tax and gratuity. The two exceptions are for those parties interested in having the use of the full venue and for those who wish to come in on a day or at a time when we are normally closed. For the exclusive use of the venue during our normal hours of operation, we ask that you spend at least $1500 for each hour that we will be closed to the public. Food and drinks purchased for the event is applied to the minimum spend. If you would prefer to host your event on a day that we are not normally open, or during hours we would be closed to the public, we ask for an open fee of $600 for off days and $300 to $600 for off hours. This fee is in addition to your food and drink costs. Once you have decided on a date, we will require a deposit and signed contract to secure your booking. The deposit will be applied to your total bill, and the balance will be due the day of your event. We held our son's engagement party here. The space was beautiful and the food was incredible! We received so many positive comments from our guests. Kristin was so easy to work with and was very responsive to our questions. I highly recommend The Wine Loft! 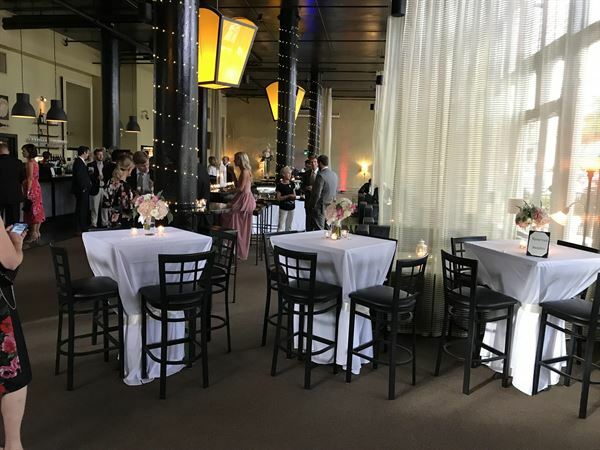 We had my daughter's rehearsal dinner at the Wine Loft last week. It was a fabulous experience. Since we are out of town, it was difficult finding a venue that would work for our group and we had a relatively small group of about 40. Once I contacted Kristin at the Wine Loft, I knew this venue would be perfect. Kristin made the planning process so easy. She was always quick to respond to all of my questions and her recommendations were spot on. The venue has a classy, yet casual, ambience. It was conveniently located to our hotel, the food was delicious, and there were so many options of wine and beer for our guests. To top it off, it is also very affordable. I highly recommend this venue for any type of gathering you may have. Staff worked with me to provide the best experience at the wine loft for my girlfriend. They allowed my guest to arrive early & be seated in the reserved spot. Food was awesome & wine/ drinks were great. This is a spot that everyone must experience especially if you enjoy wine and the ambience of mood lighting. Thanks for the 5 stars! We are so happy to hear that you had a wonderful experience. Take care!